Create crafts with a horse-related theme to hang in your garden or to accessorize your riding buddy. 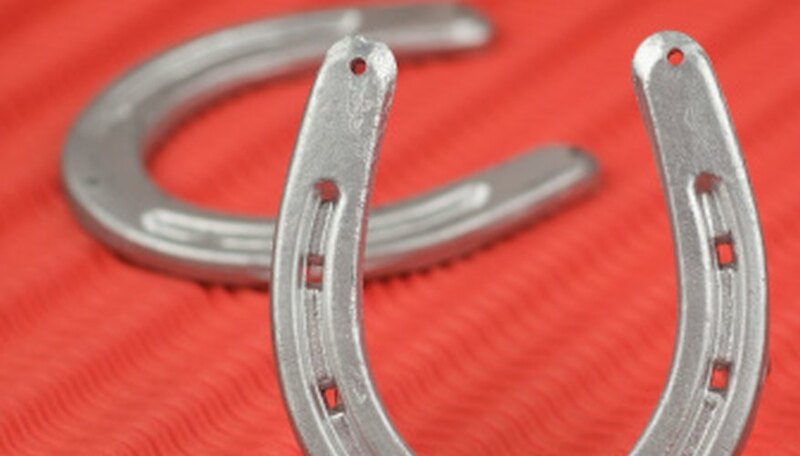 Horseshoes are popular elements in a variety of craft projects, including horseshoe wind chimes. Alter the design to add hanging crystals or connect the horseshoes with beaded wire to add color to the project. If you prefer to craft a rhythm bead necklace for your horse, alter the design using any type of beads and omit the jingle bells. Adjust the size so that the rhythm necklace fits over the horse’s head easily to rest at the drive line. Open 15 20-gauge jump rings with round nose pliers. To open the rings, push and pull the metal at the split; do not pull the metal in opposite direction. Hook one jump ring through the two holes at the end of one horseshoe. Slip one end of one 2-inch length of chain through each open ring. Close the rings. Hold the loose ends of the two chains together. Fit another jump ring through the last link in both chains. Close the ring. This ring is the hanger for the wind chimes. Slip one jump ring through the top of one craft bell. Attach the same jump ring through the hole in the center of the horseshoe dangling from the two 6-inch chains. Close the ring. Slip a jump ring through the last link in two 8-inch sections of chain. Fit one of the open rings through each hole in the horseshoe on each side of the craft bell. Close the jump rings. Fit each open ring at the opposite end of the two 8-inch long chains through the holes at the end of another horseshoe. Close the rings to add the horseshoe to the wind chimes. Add another craft bell in the center of the second horseshoe. Add the remaining two lengths of 8-inch chain to each side of the craft bell. Attach the third horse shoe to the last links on the last two 8-inch chains. Attach two craft bells to the bottom of the last horseshoe with jump rings. Cut a 64-inch long strand of leather beading cord. Tie two overhand knots, one on top of the other, 5 inches from one end. Thread three 6mm wood beads, three 7x3mm copper beads, two 10x10mm shell beads and one jingle bell over the open end of the cord to the knot. Repeat this pattern to fill the cord with beads, up to 5 inches of the end of the strand. Cover the knots at the beginning and end of the strand with jeweler’s glue. Let the glue dry. Tie the rhythm bead necklace around your horse’s neck with the leather strips on each end of the strand.